The Smashing Pumpkins stopped by The Zoo to talk about their gear, touring, and their history with Yamaha. Watch this exclusive video with Jeff Schroeder giving us a rundown of the RS720B, one of his main guitars when in the studio or on tour. Jeff is also plugged into a THR100H Dual head, one of the best analog, tube-modeling solid state guitar amps on the market! Highlights From The Plini Strandberg Clinic At The Music Zoo! Our good friend Plini stopped by The Zoo to put on an awesome clinic, where he would partake in an insightful Q&A session, give us some background on his collaboration with Strandberg Guitars, and playthrough a few of his most popular tracks! If you weren't there, watch the exclusive highlight video above to catch a glimpse of what you missed! Mike Stern Yamaha Clinic & Sales Event - Saturday, 10/14 at The Music Zoo! Please join us on Saturday, October 14th at 2PM for our Yamaha Clinic & Sales Event Featuring World Renowned Jazz Guitarist Mike Stern at The Music Zoo in Roslyn, NY! Mike Stern will be performing in-store and Yamaha representatives will be on hand with incredible deals on Yamaha gear during the event only. This event is FREE and open to the public when you RSVP here! Store Event: Steve Vai Masterclass At The Music Zoo To Benefit Family & Children's Association! The Music Zoo is extremely excited to host a Steve Vai Masterclass at our store on August 24th, 2017 at 7 pm! The event will begin with a one-on-one interview with the incredibly knowledgeable Andy Aledort, and is sure to be an intimate experience that will allow you to hear the legendary musician speak about tone, technique, and everything guitar and music-related! You are more than welcome to bring your guitar along with you to the class. There will also be an opportunity after the event to have your picture taken with Steve. 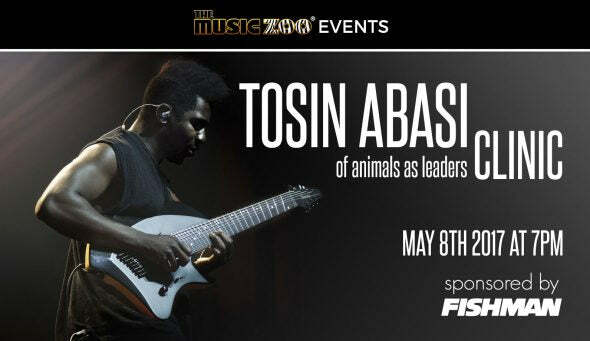 In-Store Events: Tosin Abasi Clinic At The Music Zoo!